174 pages | 8 B/W Illus. The capability approach has developed significantly since Amartya Sen was awarded the Nobel Prize in Economics in 1998. It is now recognised as being highly beneficial in the analysis of poverty and inequality, but also in the redefinition of policies aimed at improving the well-being of individuals. The approach has been applied within numerous sectors, from health and education to sustainable development, but beyond the obvious interest that it represents for the classical economics tradition, it has also encountered certain limitations. While acknowledging the undeniable progress that the approach has made in renewing the thinking on the development and well-being of a population, this book takes a critical stance. It focuses particularly on the approach’s inadequacy vis-à-vis the continental phenomenological tradition and draws conclusions about the economic analysis of development. 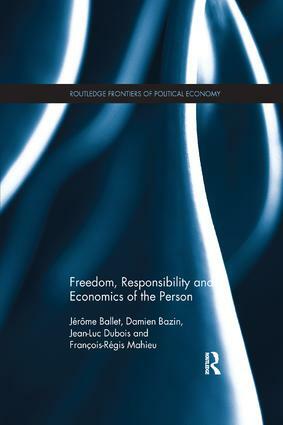 In a more specific sense, it highlights the fact that the approach is too bound by standard economic logic, which has prevented it from taking account of a key ‘person’ dimension — namely, the ability of an individual to assume responsibility. As a result, this book advocates the notion that if the approach is used carelessly in relation to development policies, it can cause a number of pernicious effects, some of which may lead to disastrous consequences. Due to its multidisciplinary nature, this book will be of interest to those working in the fields of economics, philosophy, development studies and sociology. Jérôme Ballet is Senior Lecturer in Economics at the University of Versailles Saint Quentin-en-Yvelines, France, and Researcher at the Institute of Research for Development, France. Damien Bazin is Assistant Professor in Economics at the University of Nice Sophia Antipolis (GREDEG), France. Jean-Luc Dubois is Research Professor at the Institute of Research for Development, France, and he teaches at the Catholic University of Paris, France. François-Régis Mahieu is Emeritus Professor of Economics at the University of Versailles Saint Quentin-en-Yvelines, France.